It won't be long before the less developed part of Karachi that has so far hidden behind mountains of Manghopir will meet the rest of the relatively developed city. Twenty-five year old Mohammed Arshad, lay on a bed in Ward No. 3 of the newly built Indus Hospital at Korangi Crossing. He was being tended to by his father, Ghulam Mohammed, as he looked across the lush green premises of the hospital clearly visible through the glass windows. A recent report published in The News said that Pakistan and India are likely to ink an agreement on Sir Creek in near future. If this dream materialises, it will bring solace to tens of thousands of fisher folk in the two neighbouring countries, who, at the moment, are apprehended by security forces when they unwittingly enter each other's territorial waters. 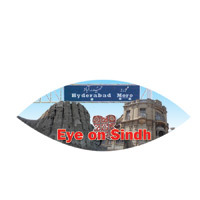 To those who are familiar with the political history of Pakistan in general and Sindh in particular, it is not surprising that Hyderabad has always remained in the political limelight. Work on Khasa Hills, one of the most innovative development projects being carried out in Karachi right now, is in its final stages. It is expected that the project will be completed by the end of this year, and is set to bring the other half of Karachi from behind the hills in direct contact with the city. The road, which is 280 metres long, cuts through the Manghopir mountain range. The mountain it cuts to is 400m thick and 65m high. Once open to traffic in December, the road will connect Qasba Colony to Nazimabad, Sohrab Goth, and North Karachi, reducing both the distance and travelling time between Qasba Colony and North Nazimabad. Initiated in March 2007, the project had an approved budget of Rs200 million. The road between Qasba colony and North Nazimabad is scheduled to be open to traffic by December 2008. Once functional, it is estimated that the distance between Qasba Colony and North Nazimabad will be slashed from 15 kilometres to one kilometre. Right now, on an average day it takes approximately an hour and a half to travel between the two places. The new road, however, will take up 50 percent of the traffic going from Orangi Town to Benaras Chowk in S.I.T.E., cutting the travelling time down to a maximum of 10 minutes. Authorities who spoke to Kolachi said that the project would be of great benefit to both parts of the city on either side of the mountain range. "At one hand it would reduce the distance," said Naib Nazim of S.I.T.E. Town. Syed Badshah, "while on the other hand, it would bring North Nazimabad closer to Orangi Town." S.I.T.E. Town meets the road under construction at Muhammad Pur Colony. The other end of the road is in North Nazimabad Town at Usman Ghani Colony. According to Badshah, days before its inauguration, the project has already started to benefit the people of the area. "The real estate value in this area has tripled in a year," says Badshah. This can be gauged by the fact that a house that would have sold for one million rupees two years ago now sells for 3 million rupees. Badshah adds that even with the current price, people are not willing to sell their property, as they hope prices will rise further once the project has been completed. "The people of the area are more than glad with this project," says Badshah. However, when the project began a few years ago, the government faced stiff resistance from the residents of Muhammad Pur Colony. This was why the project, which was intially scheduled to be completed by the second half of 2007, ran into a delay. "It was not an easy project," concedes Director Khasa Hills Project, Ali Raza Brohi. Originally a project of the City District Government Karachi, the National Highway Authority was given the contract of the Khasa Hills project. In addition to linking the two parts of the city, the project would include the installation of utilities, the relocation of existing utilities, and the removal of encroachments. "That was the toughest of jobs, even more so than cutting through the mountain," says Brohi. Brohi explained that some 84 houses at Muhammad Pur Colony were to be fully or partially displaced to make way to the road. The people of the area were reluctant to vacate the area possibly because of the perception that the project was aimed against Pakhtoon community." There is a large Pakhtoon community in Mohammad Pur Colony, an extension of Qasba Colony in S.I.T.E. Town. Qasba Colony has an estimated population of 120,000, out of which 40 percent are thought to belong to Pakhtoon and other ethnic communities. The rest are known only as Urdu-speaking. Most of the residents of Qasba Colony are labourers and transporters. The majority of the Pashto-speaking residents live on the hills, while the Urdu-speaking population lives on the land below. The Orangi Pilot Project (OPP) conducted a survey of the houses in the area that would be displaced during the project. Rana Asif, who was part of the OPP team, says misconceptions and conspiracy theories surrounded the project, making it difficult for it to completed on time. The project was under the supervision of the city government led by the Mutteheda Qaumi Movement, leading many to believe that only the interests of the Urdu-speaking people were being taken into account. "The Pakhtoon community in the area thought that this project was aimed at reducing their numbers in the area," says Asif. "They refused to vacate their houses until they reached a consensus with the government after a series of negotiations." According to Brohi, the consensus included "paying off compensation money according to the market value of the area regardless if the house was leased or not". Asif adds that the inhabitants of the displaced houses were paid compensation money ranging between Rs400,000 and six million rupees, depending on the value of the houses. This included both leased and unleased houses on the hills and on the land below. Asif believes it is "too good to be true" if the government paid compensation of the unleased houses, and that too within 15 days of negotiations, but concludes that this must have been what had happened to avoid thnic conflict with in the area," she believes. "If the project had been aimed at reducing the demographics of one ethnicity, as was believed to be the Pakhtoon community, then displaced people would never being allowed to build their homes in the hills adjacent to their older homes," says Asif. What she terms to be a conspiracy theory - that the Pakhtoon community was deliberately displaced - still exists, but according to Asif, it is contrary to ground realities. In addition to being delayed because of such conspiracy theories, Brohi says that technical problems such as removing hard rock caused the project to be delayed. The rock could easily have blasted away, but he says: "People would have been upset with the use of dynamite." Instead, it had to be done mechanically, which took many months. "The mountains will now be accessible and in control of the governments," remarks Town Nazim of North Nazimabad Town Ahsanullah Khan. In North Nazimabad, some 76 homes had to be completely or partially displaced to make way for the road. Ahsan, too, rejects the idea the displacement was aimed at any particular ethnicity. "Both the Pakhtoon and Urdu-speaking population were equally displaced," he says. Ahsan believes that the project will enable governments improve security in the hills and to administer the area better, which had been shunned behind mountains for years. "The entire city would be secure," he claims. Meanwhile, Badshah says that as well as improving security, the project would benefit investors, as both sides of the road would be available for commercial purposes. With 80 percent of the project complete thus far, project director Brohi is hopeful that it will benefit the entire city by the end of the year. While on one hand the Khasa Hills project would facilitate day workers and students to commute easily to and from North Nazimabad Town, on the other hand it would also act as a safe passage for criminals to their hideouts after committing house robberies, snatching mobile phones and vehicles from North Nazimabad. This will eventually add to the already high crime rate in the area, claim police officials. According to police sources, the crime rate would definitely increase by about 20 per cent at Usman Ghani Colony in North Nazimabad while the Muhammad Pur Colony at SITE would remain unaffected. Rustam Khan, SHO Pirabad Police Station says, "It will rather help decrease the crime rate at our side as criminals will focus more on the relatively affluent North Nazimabad area than the poor slums on our side." Usman Ghani Colony that houses the families of middle-income groups residing mostly at bungalows would be lucrative for dacoits of Muhammad Pur because, "unlike the past, the criminals would now safely escape through the road to the other side without having to pass through the complicated mountainous tracks," adds Babaruddin Babar, SHO Manghopir Police Station. Babar adds that worldwide squatter settlements provide home to a great number of criminals, which is Muhammad Pur in this case, and when the slum is accessible to a developed area – like in the case of this part of North Nazimabad - it increases the crime rate. Explaining the reason behind the increased crime rate, Babar says, "When poor labourers from the slum see the rich and well-off living a luxurious life with all the facilities when they cant even afford two square meals a day, they rebel and try to achieve the same by resorting to crime." Babar tells Kolachi that drugs and weapons are easily available in Muhammad Pur Colony too, thus strong safety measures are needed at both sides of the road to prevent the crime rate from rising further when the project is completed. "Particularly in Usman Ghani Colony the crime rate is already high," he says adding that there is a dire need to increase the police force and the number of police stations on both sides. The number of FIRs registered in the past five years at Shara-e-Noor Jahan administering Usman Ghani Colony at North Naziamabad as compared to those registered at Manghopir and Pirabad police stations further proves the observations made by Rustam and Babar. According to the data collected by the Citizen Police Liaison Committee (CPLC), the rate of all kinds of crime registered at the Pirabad and Manghopir Police stations at Qasba Colony combined is less than that registered in the jurisdiction of Shahra-e-Noor Jahan police station. The latter has approximately 51 per cent share of the total crime registered in both areas in five years. Out of the 4,221 FIRs registered at these three police stations from 2004 to September 2008, the jurisdiction of Shahra-e-Noor Jahan police station stood out in the crime rate with 2,162 cases registered here. Next in the row was the Pirabad police station with 2,059 crimes registered whereas the Manghopir police station reported the least share with only 839 registered complaints in its jurisdiction. SHO Shara-e-Noor Jahan police station, Khanzada, however rules out the possibility of the shift in crime as according to him: "Crime rate is not related to the construction of a road. The road is a sign of development and would not add to the crime rate," he believes. Therefore, Khanzada does not think the area needs 'safety measures' as such. He, however, stresses on improving and increasing the police force across the city to reduce the crime rate in general. In a separate move, those residents affected by the Gora Khasa Hill project in Qasba Colony have been compensated accordingly by the government who have shifted to other locations after receiving their payments, Kolachi has learnt. A new road is being constructed in Qasba Colony by dissecting the Gora Khasa Hill where numerous houses once stood. The road is being constructed by the National Highway Authority (NHA) which aims to connect Qasba Colony with Shahra-e-Noor Jahan in North Nazimabad. After dissecting the hill, NHA has almost levelled the road that stretches about a kilometre. At the moment, however, the residents and visitors travel through Benaras Colony, Abdullah College and Asghar Ali Shah Cricket Stadium to reach Shahra-e-Noor Jahan. The length of this passage is about eight kilometres. In the area, there are people who live on the steep hill while some of them reside on the plateau as well. Majority of the houses on the hill belong to the Pukhtoon Community. It is interesting to note that there are around 16,000 houses on the hillside in this part of the city that stretches from Qasba Colony to Benaras Colony. The colony consists of two parts, a large part of which is situated on the plain area covered by a hill on one side that presents a rare and beautiful scene of plain hill dividing the city. The authority concerned has dug the hill up to 400 feet. According to the residents of Qasba Colony, before the dissection of hill for the construction of a road, people whose houses were demolished were fully compensated by the Revenue Department of the Sindh Government. Muhammad Shamshair Khan, a resident Qasba Colony, said most people feared they would not be compensated by the government after being displaced, as has happened in most cases in the past. Some people also protested, however, they were soon compensated. He further informed that there were two categories of those who were affected by this project. "There were some people whose houses had a 'leased' status and few houses were not leased," he said. Majority of those situated on top of the hill were not leased. However, people living near the plain area had been granted lease by the government. He said that compensation amounting to approximately Rs1.2 to 1.5 million was granted by the government to the affected residents and about Rs200, 000 were given to those residents whose houses were not leased. "We also learnt that the government compensated some affectees up to an amount of Rs10 million who had large houses on the steep side of hill, near Shahra-e-Noor Jahan," he said. Residents also informed that during this period, some people inhabited the hill through makeshift homes expecting to receive compensation from the government. However, they could not succeed as they were not genuine inhabitants of the area and were quickly identified by the residents. The Union Council Nazim of Qasba Colony, Meer Muhammad Fasahatullah, told Kolachi that the government had conducted a survey before taking concrete measures of digging the hill. He said only those people were compensated whose house were surveyed and demarked. "The people were given compensation in accordance with the status of their houses," he said. Fasahatullah said this project is not something new for the government as it has taken a similar initiative in 1988 as well. However, practical steps could not be taken due to certain limitations at the time. One other resident of the colony, Asif Hussain, said that around 110 houses were demolished by the concerned authorities during the construction of the road. However, there are still some houses that are situated along the new road that are dangerous for inhabitation considering the threat and frequency of blasts in the surrounding area, say observers. According to the residents of the locality, two months back, a child lost his life when the walls of his house collapsed due to a bomb blast in the area. It was also learnt that the current state of the newly constructed road is not passable for vehicles compelling residents to travel on foot. This is, however, not very difficult considering the fact that Shahra-e-Noor Jahan is situated at a walking distance from Qasba Colony. Despite the hurdles, most residents do not resent the move as the government compensated them in time. Sadly enough, that is all he could do after an unfortunate accident two and a half years ago in which he fractured his leg that later had to be cut off. Arshad, who was then a soldier associated with Special Communication Organization (SCO) - an army-run organization which provides telecommunication service in Azad Kashmir and 'Northern Areas' - was working on cell booth in the Kotli district of Azad Kashmir when he fell off and fractured his leg. The incident took place in 2006. He was immediately taken to MDS and subsequently shifted to CMH (Combined Military Hospital) in Rawalpindi where he remained under treatment for eight months. However, the metal plate fixed in his leg to repair the fracture developed an infection, prompting doctors to perform another surgery to remove the plate. "The doctors told me that my bones did not join properly and then cut my knee," Arshad told Kolachi adding that his health did not improve while at CMH Rawalpindi compelling him to shift to another private clinic where he was admitted for four months. His misery, however, did not end there. The doctors who operated on him further told him that his bones were infected and had been producing pus due to which they had to cut his infected bones. Arshad's recovery then seemed impossible to the family that had already spent Rs100, 000 but saw no improvement in his health, said his father. "When I had exhausted all my money, a doctor at the clinic advised me to approach the charitable Indus Hospital," Arshad said. He was admitted at the Indus Hospital on September 22, 2008, and four days later, doctors performed surgery on him following which he was told that his treament would take another year. During this time, Arshad also tied the knot and is trying to lead a normal life. However, he still feels strong pain in his legs. Saif Rehman, 31, hailing from Rahimyar Khan District was another patient suffering from the kidney stone disease. As there was no treatment facility at the public sector hospital in the district, he came to Civil Hospital, Karachi in May 2008 where he was given an appointment for July 17 for treatment of one of his kidneys. Since it was difficul for him to wait that long, he went to JPMC where he was also asked to wait for two months. "I was extremely disturbed when one relative phoned and advised me to go the Indus Hospital," he said. Rehman was admitted at the Indus Hospital where both his kidneys were operated on the same day. It was here where he was also diagnosed that his both hip joints were disabled. He was administered artificial hip joints on September 3 and 17 respectively by Dr. Mansoor and Dr. Amin. Earlier, he had received treatment at a private hospital in Sadiqabad in January 2007 where he spent over Rs40,000 as there was no facility available at government hospitals in District Rahimyar Khan. However despite the treatment, stones developed in his kidney again. Rehman was 16 years of age when he experienced pain in his joints after which his right leg was swollen up to the knee, he recalls. The doctors extracted fluids from affected part, but the pain resumed after a while. He suffered this pain for two years and had to use a walking stick for support. According to him, the reason he was in pain for a considerable period was because the doctors were "unable" to diagnose his disease properly. By then, both his hip joints had also become dysfunctional after which he contacted a private hospital in Punjab where doctors told him that they would charge Rs150,000 for operating on one joint that he could not afford. As luck would have it, he was soon shifted to Indus Hospital. Rehman attained his Masters degree in Seraiki literature privately while he was bedridden and became a primary teacher in 2002 in the village 'Chak-16' of Taluka Liaquatpur. Despite his condition, Rehman says he now intends to do his Masters in Economics that has always been his favourite subject. Such is the hope this charitable hospital has given to its patients who can now pursue their dreams in life without having to worry about the cost of their treatment. Pakistan and India initiated a joint survey of the disputed maritime zone, Sir Creek in the Rann of Kutch marshlands, in January 2007. The survey was led by surveyor general of Pakistan Major General Jamil-ur-Rehman Afridi and chief naval hydrographer of India, Admiral B. R. Rao. Sir Creek, the seventh creek of the Indus delta, has long been a sore point for both countries, and a source of distress for fisherfolk since independence. It assumed greater importance when it was found that it contained rich deposits of oil and gas. Control over the creek suddenly had a huge bearing on the energy potential of each nation. Lately, the media has been highlighting the plight of fisherfolk. Today, fishermen are condemned to live in miserable conditions in Pakistan, despite the fact that fishery has immense potential. It ensures $200 million per annum in terms of export. Experts say that this could be as high as two billion dollars if shrimp farming is introduced. A visit to Ibrahim Haidery, a fishing village in the suburbs of Karachi, reveals that a large number of women are awaiting the release of husbands or sons who languish in Indian prisons because they intruded the territorial waters of India without realising it. There was time when boats laden with wool, ghee and butter would go to Karachi from the Indus delta every day. Similarly, grain would be exported to Iran. However, the building of dams and barrages upstream the Indus River has all but stopped the flow of water downstream Kotri Barrage, badly affecting agriculture and pastures in the delta. In addition, sea intrusion in the delta, coupled with the lingering of the solution of the Sir Creek dispute, has had a negative impact on the lives and livelihood of the poor inhabitants of the area. Prior to partition, farmers in Keti Bundar grew rice and exported it to Persian Gulf countries. Then, fishing and livestock rearing had a secondary importance. Now, however, now they reply almost solely on fishing. An agreement between Pakistan and India on Sir Creek will not only dispel fear amongst fisher folk of the two South Asian neighbours, who have fought two unproductive wars since achieving independence in 1947, but also open new avenues to tap energy. This optimism is based on policies pursued by the government led by the Pakistan People's Party, especially after co-chairman Asif Ali Zardari was elected President of Pakistan on September 9. President Zardari has had a different stance towards India from his predecessors. According to an interview published in The Wall Street Journal on October 4, President Zardari has been quoted as saying: "India has never been a threat to Pakistan. I, for one, and our democratic government, is not scared of Indian influence abroad." Not only does President Zardari want better ties with Delhi, notes, The Wall Street Journal, "there is no other economic survival for nations like us. We have to trade with our neighbours first." The Wall Street Journal goes on to say that Presdient Zardari imagines that Pakistani cement factories provide for India's huge infrastructure needs, Pakistani textile mills meet Indian demand for blue jeans, and Pakistani ports are being used to relieve the congestion at Indian ones. Experts believe that the liberal import policy vis-à-vis India will have a positive impact on the economic health of Pakistan and provide a cushion for the ailing economy. Pakistan will benefit enormously through imports from India, even if there is a large trade deficit. The overall current account deficit will decline significantly as machinery and raw material imports from the western countries will be substituted from India, say experts. Friendly ties between Pakistan and India would also enable the two nations to curtail unproductive expenditures and pay heed to problems in the domain of health, education and other areas. Hopefully, the two South Asian neighbours would also be able to resolve disputes related to water and nullify the predictions that the next wars in this century would be on water. Hyderabad was the provincial capital when Karachi was the federal capital of Pakistan, and is a city that has always been ripe with politics and political figures. During the pre- and post-partition years, however, just four families dominated the political arena in Hyderabad until the Pakistan People's Party (PPP) came into being: the Kazi Brothers, the Mir Brothers, the Memon community and Syed Mubarak Ali Shah (Moti Mahal). Later during the post-partition era, Nawab Muzaffar Hussein, who founded an alliance comprising the Mohajirs, Pukhtoons, and Punjabis to decrease the dominance of Sindhi-speaking people, became an important name. The political significance of Hyderabad is evident in the fact that the convention that led to the birth of the PPP was held there. Its founder Zulfiqar Ali Bhutto is said to have made the announcement in Hala (presently in Matiari district but part of Hyderabad until 2005), although some claim that the decision was taken at the residence of the Mir Brothers in Hyderabad city. Hyderabad was also the headquarters of the Muslim League when it was the only political force of its kind. Later, a division between Sindhi- and Urdu-speaking people surfaced, and analysts say that it came about after GM Syed, founder of Jeay Sindh, was defeated by Kazi Mohammed Akbar. GM Syed himself was not based in Hyderabad, but his followers were students of Sindh University, which is how Hyderabad became the centre of nationalist politics. It is said that Syed's defeat gave rise to the slogan Sindhu Desh, even though it was Syed who supported the Pakistan Resolution in the Sindh Assembly before the partition. Until the formation of Pakistan Peoples Party in 1967, the politics of Hyderabad comprised only the Muslim League and its rivalries. After the emergence of the PPP, other religious parties such as Jamat-e-Islami (JI) and Jamiat Ulema Pakistan (JUP) came to dominate Hyderabad politics, particularly where the Urdu-speaking population was in the majority like Phuleli/Paretabad. However, observers and historians say that it was during the late eighties when the Mohajir Qaumi Movement (now Mutheheda Quami Movement, or MQM) came into being that the political scenario in the city began to change. The MQM gained a major share of the politics. Its popularity was such that other political forces were almost removed from the picture. For the past three decades, the MQM has dominated the Hyderabad district. It has a majority in both provincial and national assemblies in the newly formed Hyderabad district. Earlier, Hyderabad comprised three districts: Tando Allahyar, Tando Mohammed Khan, and Matiari. In the politics of Hyderabad today, the MQM has four Members of Provincial Assembly (MPAs) and two Members of National Assembly (MNAs). The party also rules the district administration with Kanwar Naveed Jameel as District Nazim and Zafar Ali Rajput as District Naib Nazim of Hyderabad. Both represented Hyderabad earlier in the Provincial Assembly. By contrast, the PPP has two MPAs and one MNA. The MQM has introduced new and young faces in Hyderabad at a national and provincial level. The party has a record of bringing fresh candidates in every election, thus exploring the political capability of these workers and activists. Other political parties, meanwhile, stick to dynasties. 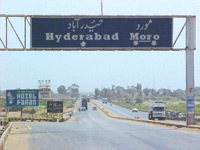 Hyderabad has produced many well-known political figures, such as Miran Mohammed Shah (father-in-law of Qamar-uz-Zaman Shah and maternal grand father of Syed Naveed Qamar, Finance Minister). Shah became the speaker of the Sindh Assembly. Kazi Abid and Kazi Akbar (both belonging to the family of first female speaker of National Assembly Dr Fehmida Mirza) were ministers and ambassadors from Hyderabad. Those who represented Hyderabad at a federal level during the tenure of Zulfiqar Ali Bhutto included Mir Rasool Bux Talpur, who was governor of Sindh and Mir Ali Ahmed Khan Talpur, who remained Defence Minister of Pakistan. Nawab Yameen Khan, meanwhile, was part of Majlis Shura of the Zia-ul-Haq administration. Other who represented Hyderabad at a provincial and national level included Qayoom Kanpuri and Jafar Ali. However, not all has been rosy in Hyderabad. The conflict between the Sindhi- and Urdu-speaking people in the late eighties caused so much bloodshed and ran so deep that a new locality – Qasimabad – had to be formed to accommodate the Urdu-speaking population, which moved to other areas of interior Sindh after ethnic riots. The period from 1986 to 1990 is considered the worst in the political history of Hyderabad. Hundreds of people from both communities were killed, and the rest moved to safer places within their communities. The army-led Qila operation was carried out, and divided both communities to such an extent that even after 1992 when the riots ended, it took years for the situation to return to normal. People have still not forgotten what those days were like. Time, however, heals all wounds. Today, there is no violence over language or ethnic background that was so widespread in Hyderabad before. Major political parties have their strongholds, but living in different areas. This division between the two communities changed the political scene. Many formed small groups of nationalists, and to date, their headquarters are based in Qasimabad Taluka of Hyderabad. However, it is not just the passage of time that has led to the restoration of peace in the area. The situation was eased after MQM changed its name, a move that was warmly supported by Jeay Sindh Qaumi Mahaz. Recent developments at a national and provincial level of MQM-PPP coordination have also played a part in restoring order. Today, the voting pattern in Hyderabad is dependent mainly on the community and clan system. When one community supports a candidate of a party, even the people of that community living in different areas of the city vote for that candidate or party – a trend that was evident in the local bodies' elections of 2001 and 2005. After the independence, the minority did not play a large role in the politics of Hyderabad, largely because most of them moved to India. However, many other significant figures of the Pakistani government, in addition to the ones already mentioned, have either been born or brought up in Hyderabad. These include President Asif Ali Zardari, Makhdoom Amin Fahim, Speaker National Assembly Dr Fehmida Mirza, Naveed Qamar, Provinvical Fisheries Minister Zahid Bhurguri, Agricultural Minister Ali Nawaz Shah, Special Education Minister Ali Nawaz Shah Rizvi, Rural Development Minister Zubair Khan, and many others. Very few Hindu families and Christian groups live in Hyderabad, but their presence is felt through the missionary schools and hospitals that they run. Because they are low in number, they have restricted their activities to social organisations and do not play a role in politics.